Thank you for trusting Insurance Professionals of Arizona with your referral. We sincerely hope you will tell your friends, family, neighbors, and co-workers about our services. We promise to give them the same excellent service we have given you! 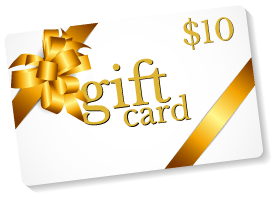 We will provide a $10 gift card from any business listed below, to any of our policyholders that refer a friend or family member to us for a quote. If you know someone who is in need of insurance services, please use the quick and easy form below, or contact us directly at (480) 981-6338. Does your friend have insurance? *Gift card will be given whether or not the referral is sold an insurance policy. In order to qualify for gift card, referral information must include working email and phone number.